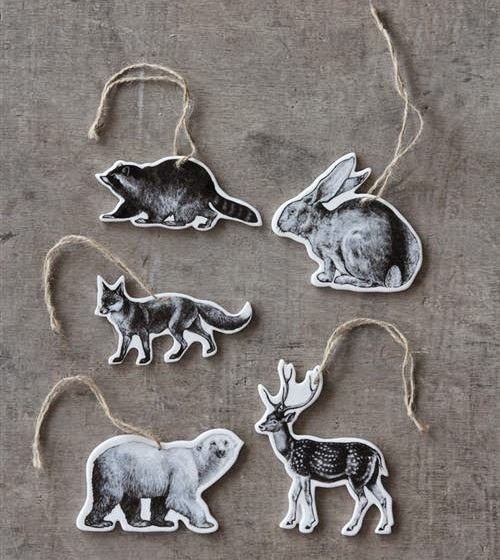 looking for our super stylish animal tree porcelain ornaments? love to dress up your tree with these modern yet classy animal-theme ornaments? need country cottage or transitional modern holiday decorations? with our modern-inspired animal figurine ornaments fashioned from ceramic with a white glazed porcelain finish; we've got just what you need. inspired by paper cut-outs from arts & crafts projects; we fashioned these ornaments to have a graceful and understated elegance. at first sight; they look light paper cut-outs but they are actually made from heavy weight ceramic! designed and crafted by hand, each ornament is fashioned from natural ceramic that is silkscreened in a neutral color for a stylish and festive look. influenced by transitional home decor trends; our newly made tree ornaments can be used to decorate christmas trees, walls or mantels. price is for a set of 5 (five) ornaments! christmas tree ornaments make great holiday gift ideas too!